One person company (OPC) is a new business structure introduced in India by the Companies Act, 2013 [No.18 of 2013]. Registering as an OPC serves as a vehicle to provide sole proprietors and entrepreneurs access to the advantages and unlimited business expansion possibilities of corporate entities. Before we look at how to register a One Person Company, let’s take a minute to understand this business structure and its benefits. According to Companies Act 2013, under section 2(62), OPC is defined as a company having only one member / subscriber / promoter. Minimum Paperwork and Compliance – Simpler regime through concessions / exemptions. An entrepreneur need not squander time, effort and resources on complex formation and compliance issues. 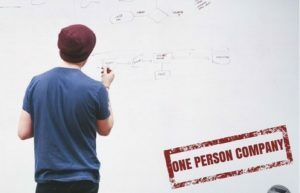 One Person, One Entity – Only one member needed to form an OPC as a separate legal entity. You can have between 1-15 directors. Easy Conversion – It’s easy to convert an OPC to other types of business structures by taking in more members and amendments to the MOU. Limited Liability – The risks of the entrepreneur are limited to the extent of the value of the shares held in the OPC. Ministry of Corporate Affairs G.S.R Notification No. 250(E) bearing date 31st March 2014, notifying the Companies (Incorporation) Rules, 2014 to the Companies Act, 2013, provides for the One Person Company Formation. Incorporation of a One Person Company as a private limited company. OPC allowed to have only one member at any point of time and may have one or more directors. An OPC can have a minimum of one director and a maximum of 15. The maximum limit can be increased by a special resolution, like any other company. Another individual as nominee director as an adequate safeguard for perpetual succession. Only natural persons who are Indian citizens resident in India are eligible to become OPC member and nominee. The term “resident in India” denotes a person who has stayed in India for a period of not less than 182 days during the immediately preceding one calendar year. A person is not eligible to incorporate more than one OPC and is not eligible to become the nominee in more than one OPC. Paid up capital not to exceed Rs.50 lakhs or average annual turnover not to exceed Rs.2 crores in three immediate preceding consecutive years. In either instance, OPC will lose its status as an OPC. An OPC cannot voluntarily convert into any other kind of legal entity unless a period of 2 years has lapsed from the date of incorporation. The exception to this rule is only in cases where capital or turnover limits as specified above are reached. Now that you know everything about it, let’s move on to how to register an OPC. Prepare all the necessary documents listed below, and then head over to the mca.gov.in website to complete the following steps. Digital Signature Certificate (DSC) Certifying Authorities (CAs) can be approached with original supporting documents and self-attested copies. Either by using Aadhaar eKYC authentication. Or by a letter/certification issued by a bank giving DSC applicant’s information as there in bank’s database and signed by the bank manager. Affidavit and declaration by first subscriber and director(s). Copies of utility bills not older than 2 months. NOC is required to be obtained from the sole proprietor/partners/other associates/existing company (If the promoters are carrying on any partnership concern/sole proprietary concern/or an unregistered entity in the name as applied for now). Proof of identity and residential address of the subscriber. Proof of identity and residential address of director(s). Proof of identity and the residential address of the nominee. Declaration: to be signed by the applicant and a practicing professional ( with valid membership number and certificate number) or a whole time secretary (member of ICSI) who has been engaged for giving the declaration. (Linked to INC-32) Electronic filing of Memorandum of Association. Subscriber(s) and witness to affix their digital signatures on the e-form. (Linked to INC-32) Electronic filing of Article of Association. Subscriber(s) and witness to affix their digital signatures on the e-form. Step 1 Digital Signature Certificate (DSC), of either Class-2 and Class-3 category, needs to be obtained for e-filing. Licensed Certifying Authorities (CAs) issue the DSC. A list of the authorised CAs with the necessary contact details is available on MCA portal under Certifying Authorities. Step 2 After obtaining your DSC, associate/register your DCS with the portal. On registration MCA system capture the details of your DSC against your DIN/PAN to authenticate your DSC. Step 3 Directors of a company need to obtain Director Identification Number by submitting an application in DIR-3 form. DIR-3 has to be digitally signed and uploaded on the MCA21 portal. Step 3 is not required now after the recent introduction of Simplified Proforma for Incorporating Company Electronically (SPICe): SPICE form INC-32. Now INC-32 integrates into itself forms INV-2/7/29 (for incorporation), DIR-3 (for DIN). Even your company’s PAN/TAN and ESIC registration can be applied for using this form. A maximum number of 3 directors can apply for DIN through the form SPICe (INC-32). Step 4 Name of the company to be registered needs to be approved first. Apply by filling form INC-1. Step-4 is optional nowadays after the introduction of SPICe (INC-32). But as INC-32 allows to apply for only one name, INC-! Can be used which allows for 6 names to be proposed. Then you can input the SRN of the approved INC-1 into SPICe (INC-32). Step 5 Application for incorporation of OPC using SPICe Form INC-32 within 60 days of INC-1. Electronically file MOA using form INC-33 linked to INC-32. Electronically file AOA using form INC-34 linked to INC-32. It is suggested to file e-Form DIR-12 along with INC-32 if the member is not the sole director of the company or if there are more than one director. Form INC-22 to be filed within 30 days of incorporation if the correspondence address is not same as the registered address. Step 6 Requisite fee payment to Ministry of Corporate Affairs (MCA) and also the e-stamp duties. Step 7 In about 48 hours your company will be registered and CIN and DIN allotted. Conclusion: The new SPICe introduced with effect from 30th January 2017 through Companies (incorporation) Fourth Amendment Rules 2016, enables hassle-free online registration of a One Person Company. If you still have any questions or doubts about how to register a One Person Company, let us know in the comments below. Note that the information provided here should not be considered as legal advice. We recommend that you consult your CA or a corporate law practitioner before you get started.